This weekend is the return of Galax Z Fair VI, and I’m most excited about seeing Rio Jordan and Juanito Castillo on Saturday night, June 17. I last saw the group at the “As I Walk Through the Valley” premiere in Edinburg, and it was awesome, as usual. So I’m very familiar with Castillo, and if you’ve never seen him live, this is a great, great chance to go out of your way to check him out. Just an amazing musician. Here are three videos to check out, to get yourselves ready for Saturday night. >> Juanito Castillo y Rio Jordan in San Benito (10/25/14) — This is a video I took of Juanito Castillo y Rio Jordan opening their set with Esteban Jordan’s “La Polka Loca” piece. It was awesome seeing Eva Ybarra and Rio Jordan back-to-back earlier that night in San Benito. Two great, unique accordionists that do a lot of experimental work within the conjunto form. Castillo here just goes all out, and it’s a great showcase for what he can do on the squeezebox. >> Esteban Jordan video uploaded by SuperMando1990 — This is a super rare video that appeared to have been ecorded off television in Mexico. It includes Esteban Jordan y Rio Jordan performing, and a interview. Love the quality too, reminds me of messing around with the antenna when I was a kid to get channels outside the Valley. Some great clips of what the legendary Jordan could do on the accordion, along with his sons Esteban Jordan III, Ricardo Jordan, and Castillo. >> Rio Jordan featuring Juanito Castillo at TCF 2015 — Robert Treviño is someone who has recorded so much great conjunto footage these past few years and someone who I strongly recommend to check out. Here he gets up close and fantastic footage of current Rio Jordan band members Esteban III (on the guitar), Ricardo (on the bass), Castillo (on the accordion), and Alejandro Valdez (on the drums). Great footage of this young, great conjunto. >> ”Acordeones de Tejas” (1/5/12) — This was the longlasting show that was shot, directed, and edited by South Texas Conjunto Association mastermind Lupe Saenz, out of Donna. It ran on KMBH, local public television, and was my favorite local program ever. This right here is a good episode of “Acordeones de Tejas”, it features Frankie Caballero from East Donna, Rio Jordan with Juanito Castillo and Rocky Beltran. Really neat stuff from all the musicians involved. >> ”Juanito Castillo – The Blind Me” — This is an amazing jazz piece on the Tex-Mex Steve Jordan Rockordeon. The title refers to Castillo being blind, and he just goes off on these amazing runs that no one else even comes close to doing in conjunto music. Please check out what he’s doing at the 1:45 mark, just running his fingers up the buttons, in total control of his instrument. 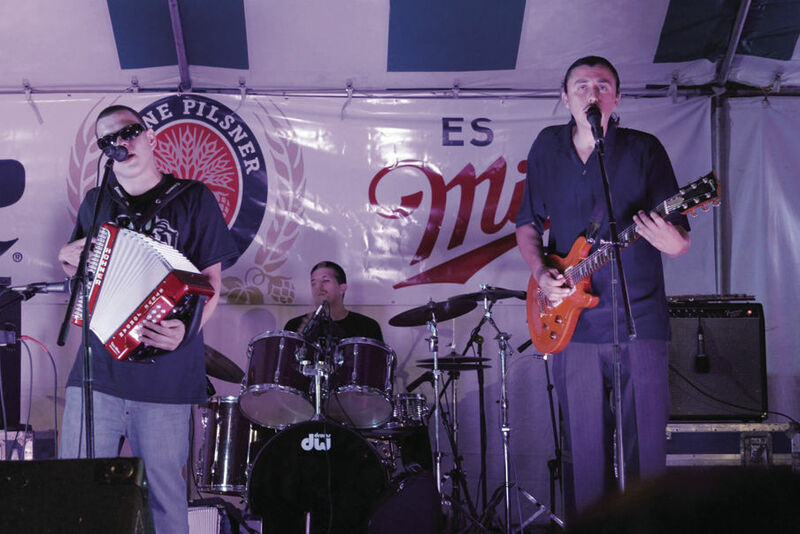 Castillo is still very young, but he’s already a master when it comes to the accordion. He pretty much continues on this onda on another video that you should check out called “Juanito Castillo – Improv”, where it appears he says “AJ Castillo, take your jazz piece somewhere else,” essentially calling out, another conjunto accordionist for his jazz performance. Accordion call outs, what a decade we live in.